The Doberman pinscher is a smart, loyal, elegant and strong breed. These dogs are versatile and highly trainable for use as companions or guards. The Doberman pinscher first came into existence in Europe in the late 19th century when breeders combined a German shepherd with a German pinscher. The breed was originally used as a guard dog. By 1977, the Doberman pinscher was the second most popular breed in America. Doberman pinschers currently live for 8 to 12 years. Whether you own a Doberman pinscher or your housemate does, learning more about the breed can help you coexist with one. Socialize Doberman pinschers as puppies by introducing them to many different people and types of animals. These dogs are protective of their owners and require intensive training to prevent aggression toward other dogs and new human beings. 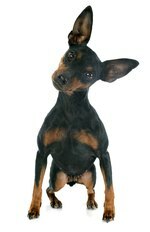 Do not keep Doberman pinschers penned in a backyard or kennel. They are very social and thrive when sharing a living environment with people. You can keep Doberman pinschers indoors or out, as long as they receive regular and copious attention. Brush Doberman pinschers' short coats once a week and wipe them down with a damp washcloth several times a week or when they become dirty. Do not allow Doberman pinschers to overeat and make sure they have many opportunities to exercise. This will help them maintain a healthy weight. Provide them with long walks, runs or play dates at dog parks. Ensure that the parents of your Doberman pinscher are both OFA certified as healthy breeders. Otherwise, you may obtain a pet with health problems. These dogs have been known to suffer from cancer, bloating from air and water retention, von Willebrand Disease and liver, spinal and thyroid ailments.